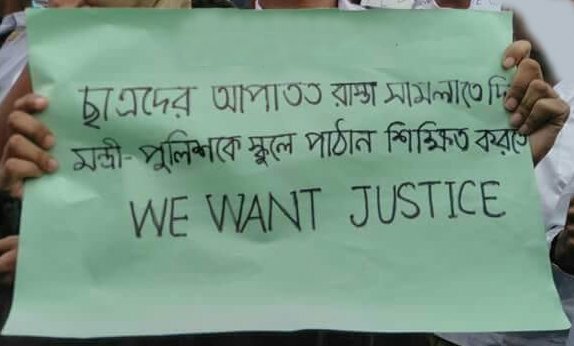 In Bangladesh, Students are protesting against road accident. The road accident is increasing day by day. Before some days a bus ride over 13 peoples and 2 students died on the spot. They are only 16 to 18 years of old. After that students of all over the Bangladesh got on the road to let government issue a strong law against road accident. In Bangladesh there is highest 3 years of jail even if they killed peoples and almost time the bus driver get ride of case by using money. Almost Bangladeshi peoples are supporting the students. They blocked the road and checking the license of drivers and surprisingly the traffic are getting clear when they take over the charge of road. This make a history in Bangladesh. The traffic police even can not control the traffic jam, but they did it in 1 day. They are using play card to express their mission. Here is one of it. It says "Let the students control the road for a while and let the minister-police join the school to get educated." Hi @habibashakil, thanks for your opinion. It was not the law but the infrastructure and the enforcement of the law.